Last updated 06 November 2018 . By Georgia Evans. To your average landlubber, the exterior of London Cocktail Club seems somewhat unassuming when compared with the wide-fronted public houses of Liverpool Street that surround it. The only distinguishable feature is the large clown face in the window... a sign of mischief to come? As we descended the narrow, dark staircase, the sound of Chic’s ‘Good Times’ starts to boom. Bringing the razzle dazzle of the big top to an underground location, the bar is brimming with kitsch fairground memorabilia, with a menu that features martini roulette and shot-deciding magic 8 ball, as well as a plethora of quirky cocktails. As more party anthems played (think big names in disco and pop from Diana Ross to Drake), bartenders sang along at the top of their lungs as guests moved from dancing in their seats to the front of the bar. The circus-themed space was popping off with city workers grabbing drinks, and couples snuggling up on sofas in the midst of their first dates, despite it being a weekday. This seems to be an average night at the bar, where fun reigns supreme and the party is always in full swing. 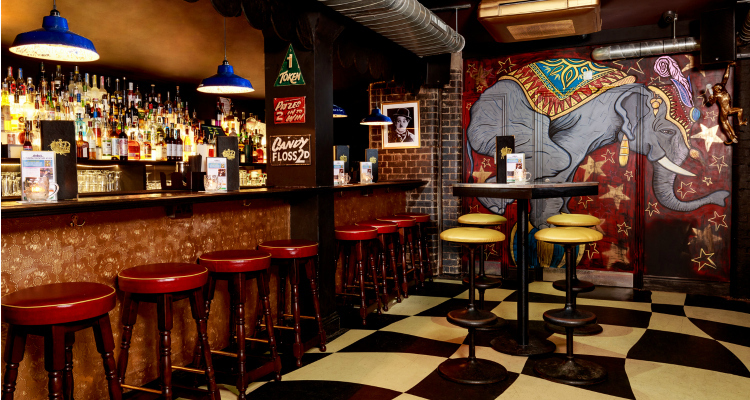 The vibrant front bar with its circus-themed decor. To really get us in the dancing mood, we were gifted with the largest, and probably most elaborate cocktail I have ever laid eyes on. The Black Pearl (£125) is a concoction made for 10 people (there was two of us) created with a generous splash of Bacardi Cuatro, Chairman’s Reserve, Plantation Dark, Woods 100, Limoncello, mint and Red Bull Tropical. I must admit, this seemed like quite a challenge, and I was determined not to get tankard, but like the young buccaneers we are, we took the plunge and drank up - with a sweet and fruity kick, the real task was not guzzling it down in one. 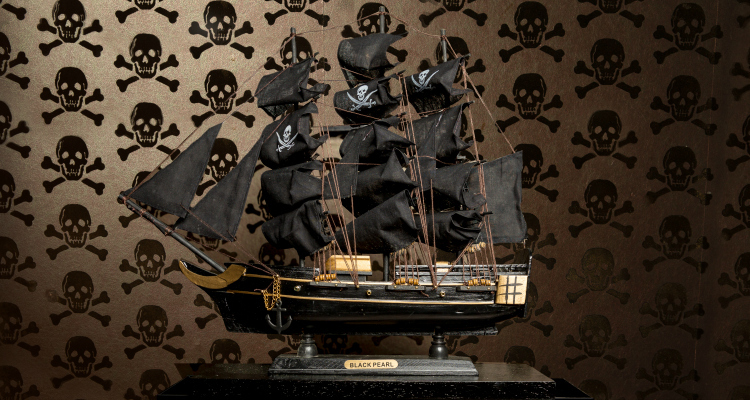 The Black Pearl, our trusted vessel for this noble voyage. Venturing on, we tested our sea legs with a couple of cocktails to sample the menu, all while making our way through the Black Pearl. Each drink on the menu has a small illustration of the glass it is served in, and as a Jurassic Park enthusiast, the small dinosaur symbol next to the Land Before Time (£15) was unmissable. 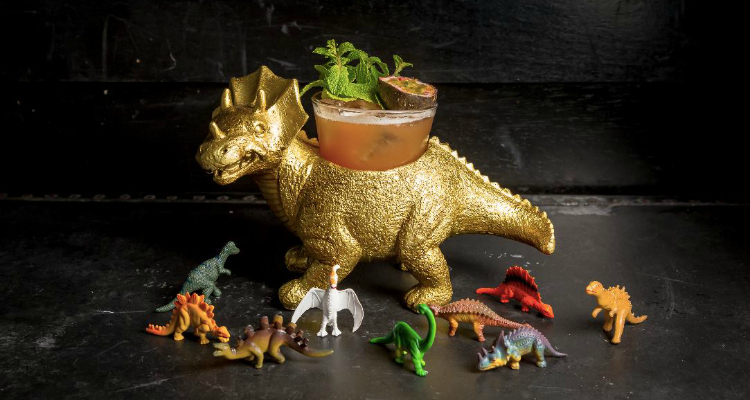 Served in a carved Ankylosaurus (yeah, I know my dinosaurs) the blend of pineapple, lime and passion fruit had a delightful zing through the Campari and rum. My cocktail came in a different dinosaur, this is a Triceratops. As I spoke to the head bartender about the In Da Nile (£15) we had also ordered, a cocktail served in Tutankhamen's sarcophagus head that featured traditional Egyptian burial spices, I was recommended my final drink. The Rose Petal Martini (£10) is a delicate, floral refresher made from Beefeater Gin, Martini Rosato, rose, lemon and cranberry. This rounded off an exploration of creative concoctions with pure elegance, and was the cue for us to have one last gulp from the Black Pearl, our trusted vessel, before walking the plank (the staircase to the world above). London Cocktail Club is a place where the party is always in full swing, no matter what day of the week. Its tongue-in cheek humour is illustrated through kooky decor and elaborate cocktails, which can charm even the oldest salt, hook, line and sinker.